I had not done an inspection in about a month, I think, until this past Friday, as Hurricane Irene was fast approaching. The results were interesting and encouraging. 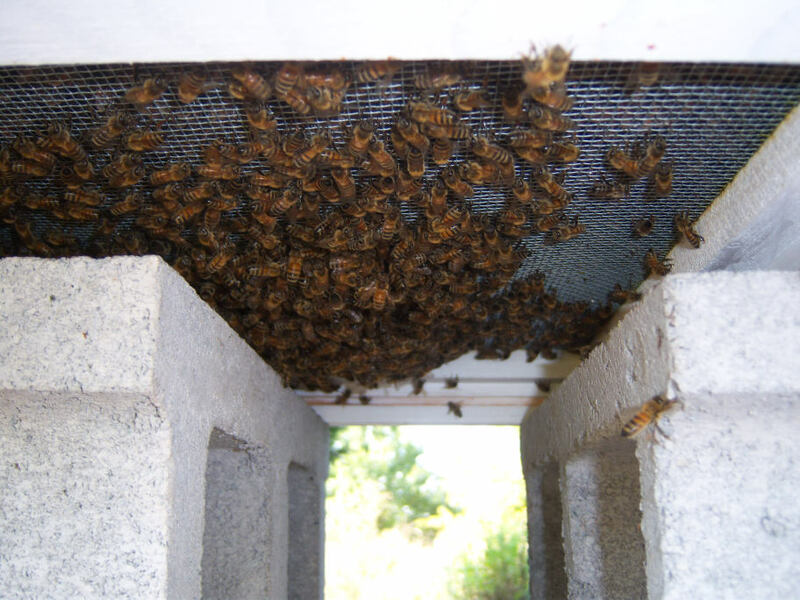 I had only just removed the entrance reducer a few days earlier, which I probably should have done a month or two ago, and there seemed to be lots of bees coming and going as well as more and more of them ‘bearding’ up along the front as well as under the screened bottom board. I continue to feed them even if I don’t do an inspection. For August I have been using a 1:1 sugar to water mixture. The past two feedings I have used 10 pounds of sugar which means roughly five pounds in each hive. 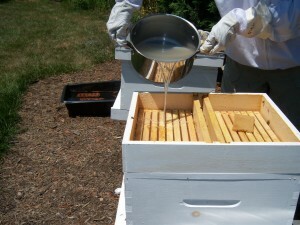 I pour the liquid in, so I don’t know if I get it distributed exactly half in each hive. Each time I feed, the liquid is completely gone and I am not sure if this ‘feast to famine’ technique is bad or not for the bees. I’m hoping not. I also switched the top board and feeding box. 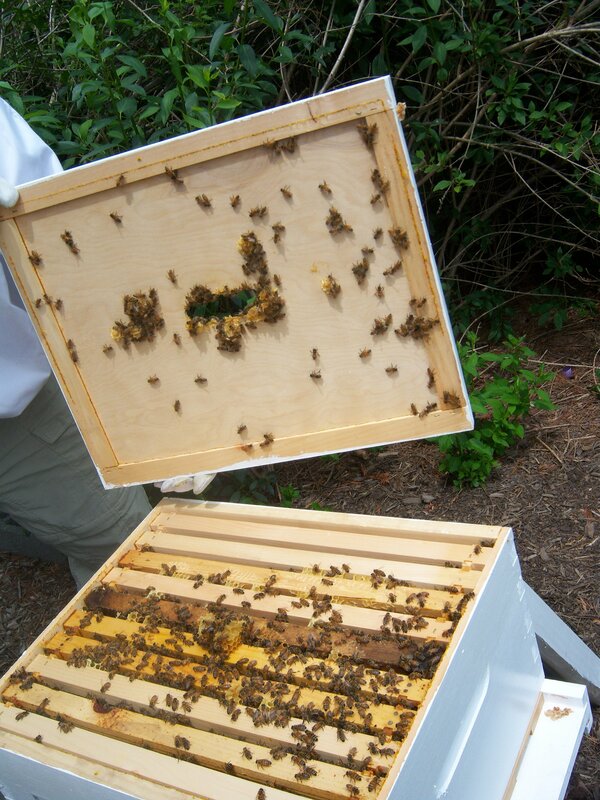 I used to have the top cover on the hive body and the feeding box on top of that. It was pointed out to me (thanks, Ed) that this was not such a good idea because it forced the bees to be in the center in order to reach the food. The top cover just has a small oval hole (about 2 in by 5 in). 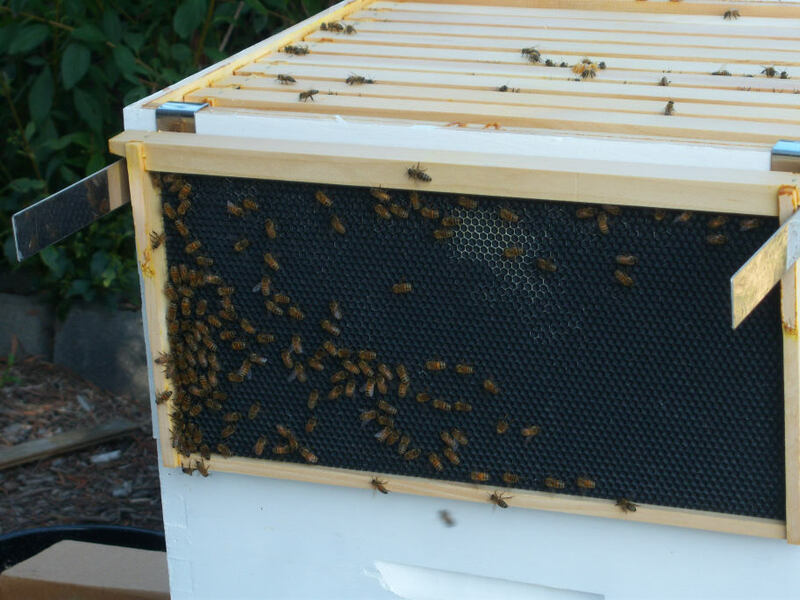 So now the feeder is right on top of the frames and can be accessed along the entire width of the hive box. This is followed by the top cover and the telescoping lid. 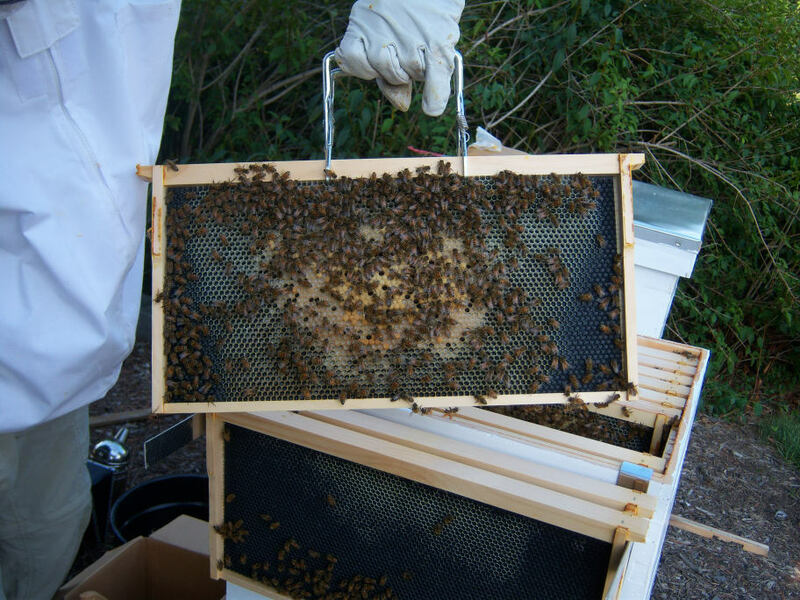 As you can see in the slide show, the Anaheim hive uses black plastic foundation and Boston uses all beeswax foundation. 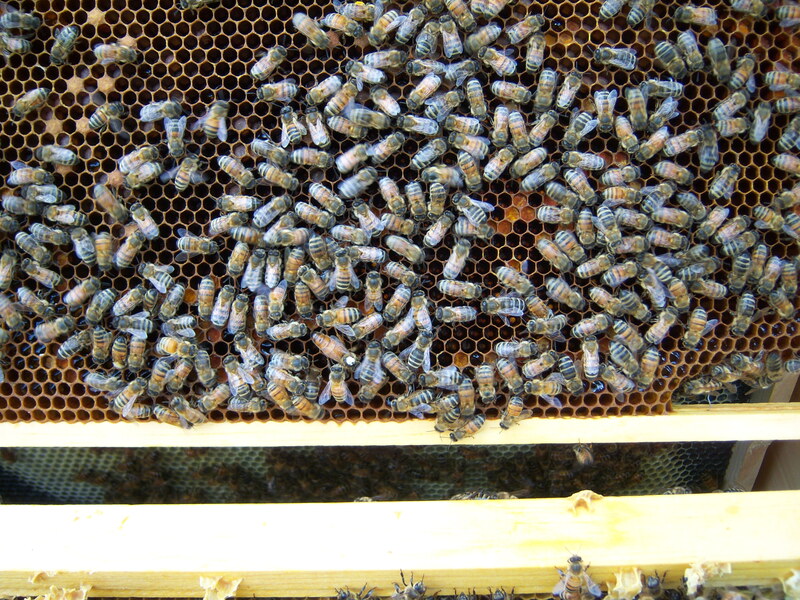 It is easier to see the comb development on the black foundation. I still don’t really know if there is any significant difference in what the bees like or in how well the two foundations function. As I worked my way in from the outer most frame on one side toward the center, you can see the increasing amount of comb being drawn. Anaheim also shows how much brood is being produced. Although I didn’t get a picture of her, I did spot the queen on the second or third frame. Assuming that she generally works her way from the center out, it was a good bet that there would be strong brood already in place toward the center. As you can see, as I made my way to frames three, four, and five the brood was indeed good there. When I closed up Anaheim and moved over to Boston, I found a different story. Recall that Boston has always been more active with more bees coming and going. I assumed that I would find even more brood in this hive. On the contrary, comb was about the same, but there was no brood at all. I don’t think the queen had even made her way up into the second story box. What I found instead of brood was some honey stores. There was not as much honey in Boston as there was brood in Anaheim, but I was happy to see any at all. i don’t know what hive development will look like moving into the fall, but storing honey must soon be the priority. Perhaps Boston has the population is needs now and is ready to store honey, whereas Anaheim is still needing to build its population and will start honey production in a couple more weeks. If this is so, then Anaheim is still the same two weeks behind Boston that is has been all season. I can’t wait to see what the hives look like in two weeks. I major question I have at this point is should I be inspecting the lower box, too. It seems like it would be so disruptive, I really didn’t think I should do it. If I needed to, though, how would I go about it? Would I just lift the entire top box off frames and all? 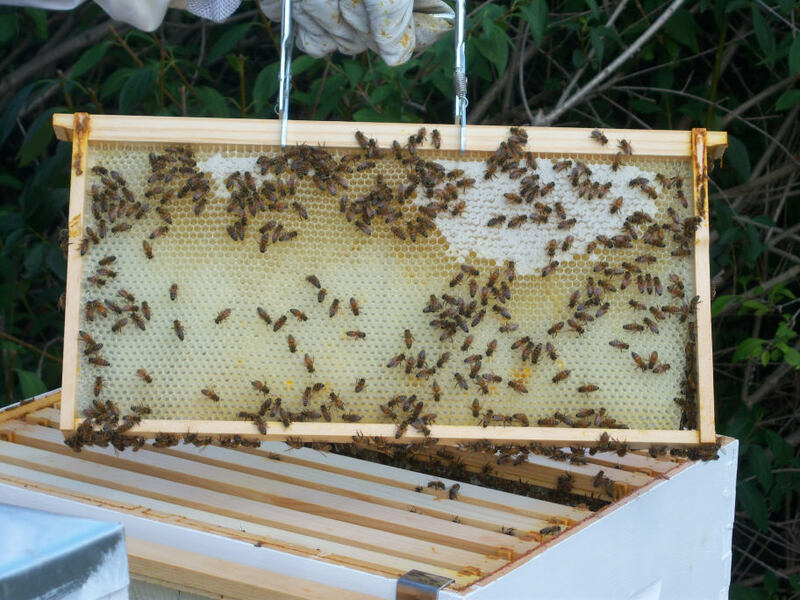 This problem will just get worse when a honey super is placed on top of the second brood box. I will need to ask some ‘experts’ about this. Each time I feed the bees I am pouring the syrup into the empty feeder and disturbing the bees as well as the small hive beetles. I kind of like this process, because I get a snapshot of the population of beetles. This time was about the same as all the others. I probably saw and squashed about 10 to 15 in each hive. That doesn’t seem like an excess, so I continue to monitor and not put any traps into the hives. One final note. I strapped the hives down just before the hurricane. It probably wasn’t necessary, but was easy to do and a good precaution. 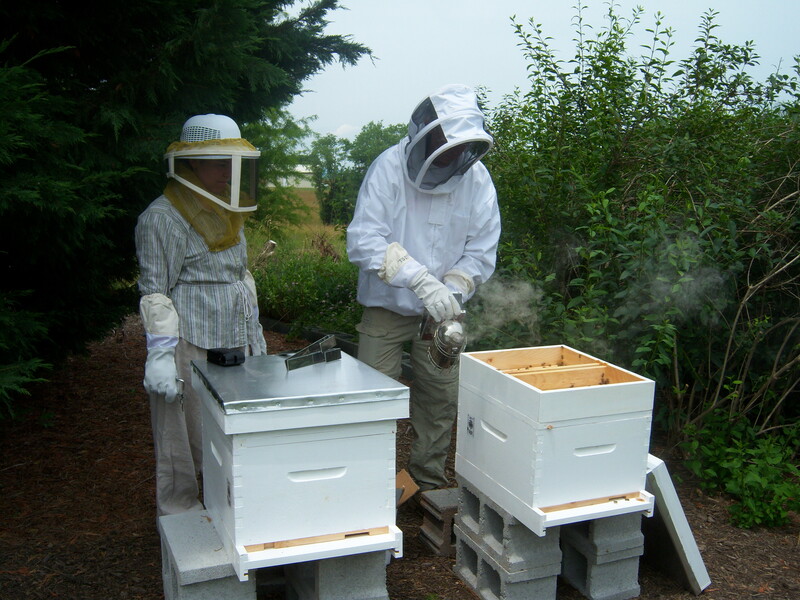 The wind was not quite as bad a predicted and the hives were fine. I looked in on the bees today. 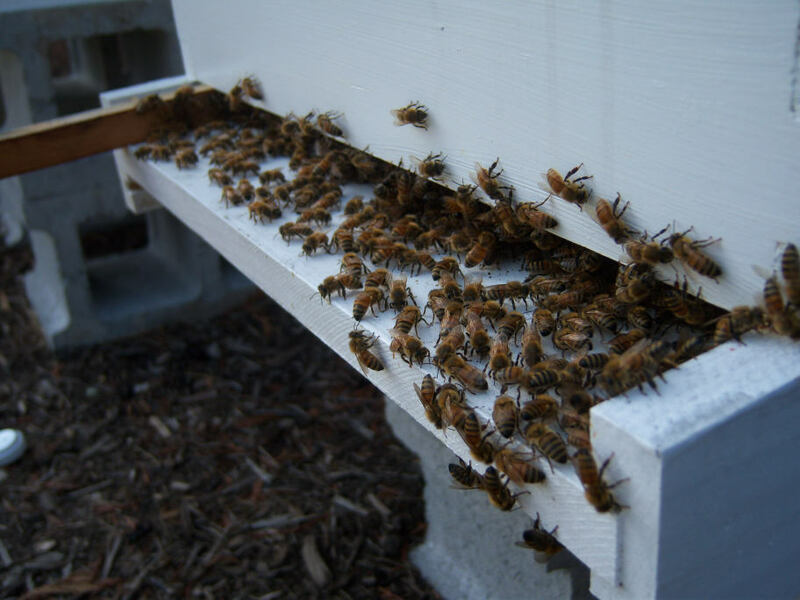 It was ideal weather – hot and sunny – and the bees were quite busy doing what they do. As usual, Joni was taking pictures for me and toward the end one bee was buzzing around her a bit too closely for her comfort and she started doing the bee dance – waving frantically and hopping around yelping. The end result was a minor sting. She never found a stinger and doesn’t remember actually feeling the sting, but after a few minutes found a spot on her arm where she was stung. Despite taking one for the team, she got some nice shots of the bi-weekly examination. I have been trying to feed the bees every week, but only opening the inner cover to examine the frames every other week. I always seem to start with the B hive (Boston) which is the more developed hive and then when I get to the A hive (Anaheim) I am a bit disappointed. So next time, I want to remember to open Anaheim first. Boston looked great. Lots of bees on the top of all the frames and all frames with at least some development. This was good progress since week six. 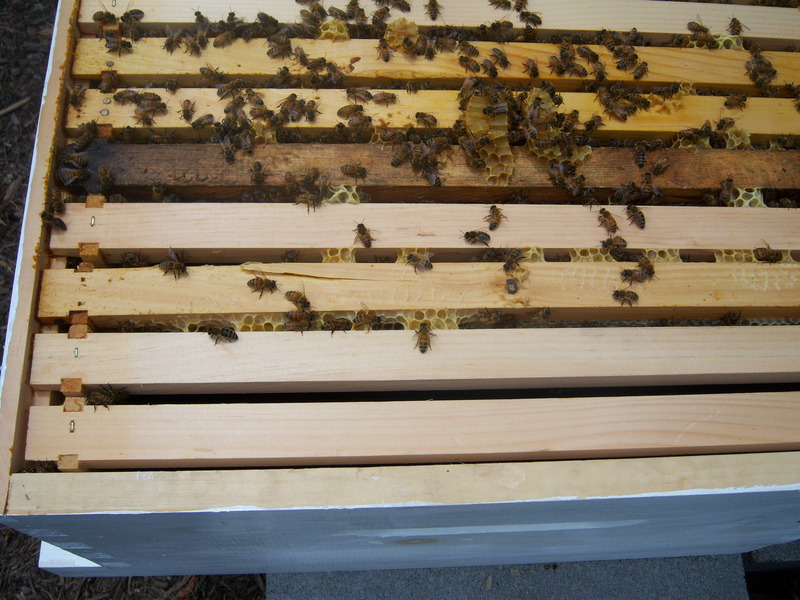 The two outer frames still have lots of comb to go, but it got me wondering when or if I should put on another box. I need to read up on mid summer maintenance. Do keepers add boxes or supers this late in the season? Do I need to worry about a swarm? Anaheim is behind, but only about two to four weeks. Hopefully both hives will be strong by the fall and will overwinter. 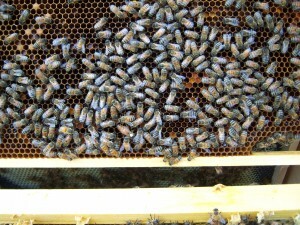 I didn’t want to take the time to find the queens, as both hives looked like they were maintaining good brood frames. 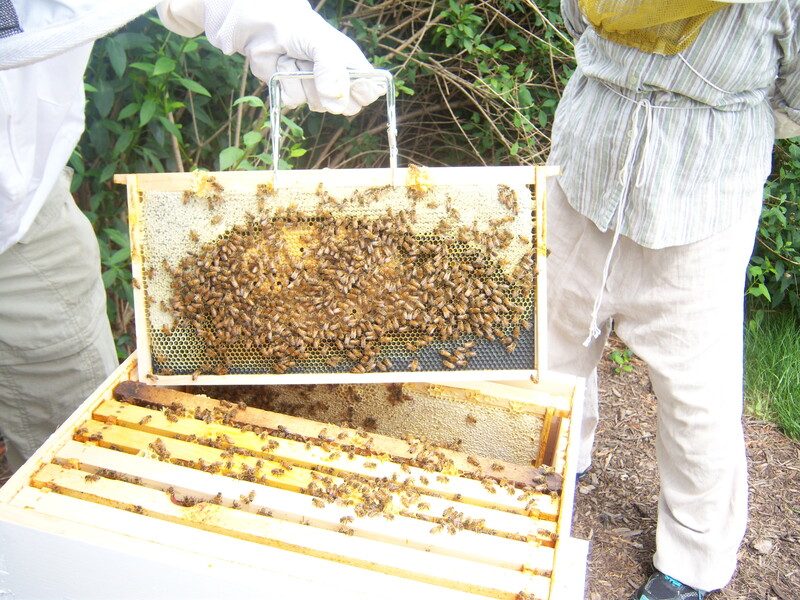 Also each hive still has a frame of honey although there were bees on them and they weren’t full. I suppose that the bees have been using some of the honey. I hope this is normal but I don’t really know. Both feeder boxes were empty. This has been working nicely because when I fill them back up with my 1 : 1.5 sugar mix (1 cup of sugar to 1.5 cups of water), I flush out a few small hive beetles which I can then get rid of usually bysmashing them with my hive tool. I am assuming that just a few SHBs is normal and not something to worry about. I keep saying that I am going to make some traps, but I haven’t done it yet. 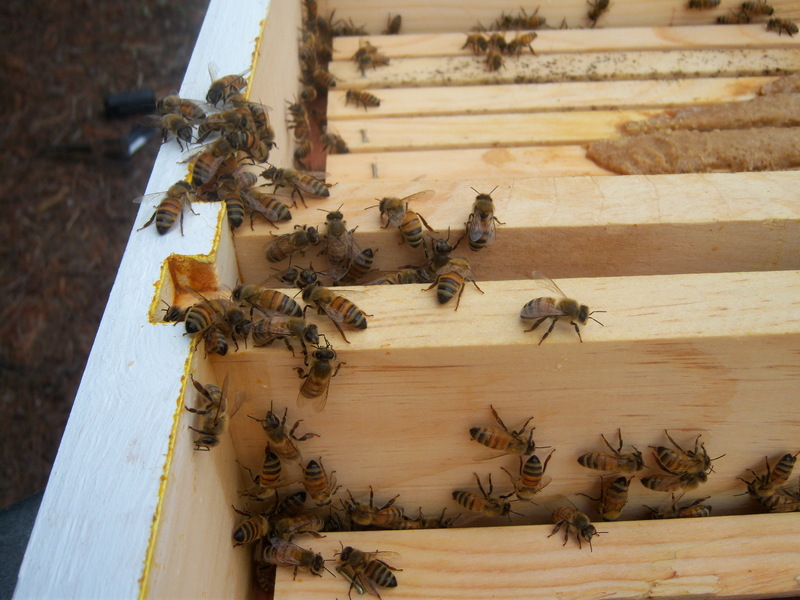 I haven’t seen any sign of damage to comb or brood. Joni got a short video which I will post. 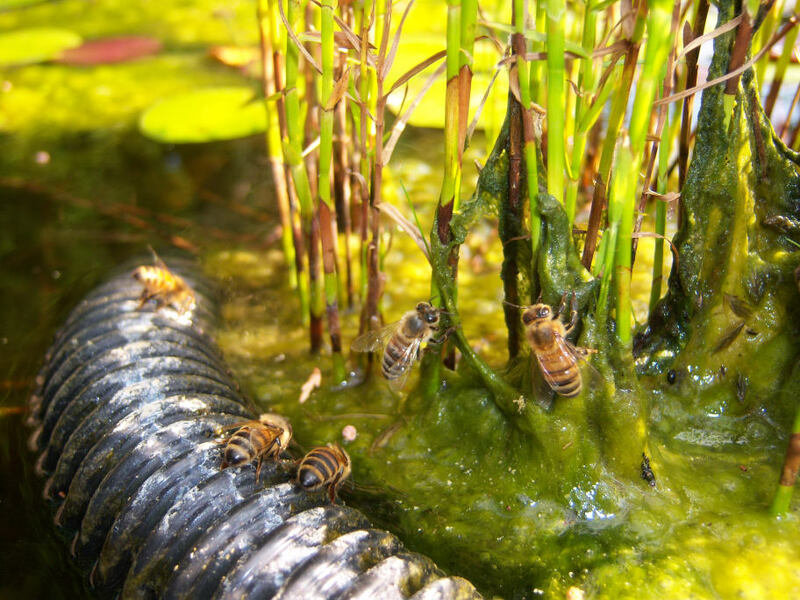 The honeybees seem healthy, but whatever it is that they are suppose to be doing, they are doing it slowly. I keep waiting for my blank frames to fill up with brood and honey, but it is just not happening. Hive A (I think I will call it Anaheim) has always been a lot less active than hive B (let’s call it Boston). 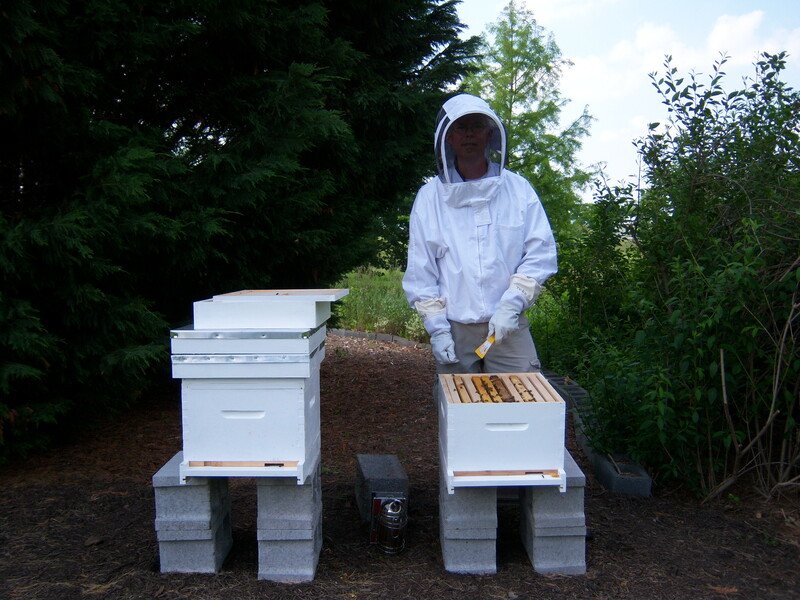 They both came as nucleus hives (nucs) from the same beekeeper, so I don’t know why one would be so different from the other. I have read that others have observed the same thing. Nobody seems to know why. After two or three weeks I began to notice that Anaheim had its moments. Around midday or early afternoon on some days, Anaheim seemed a little busier than Boston. 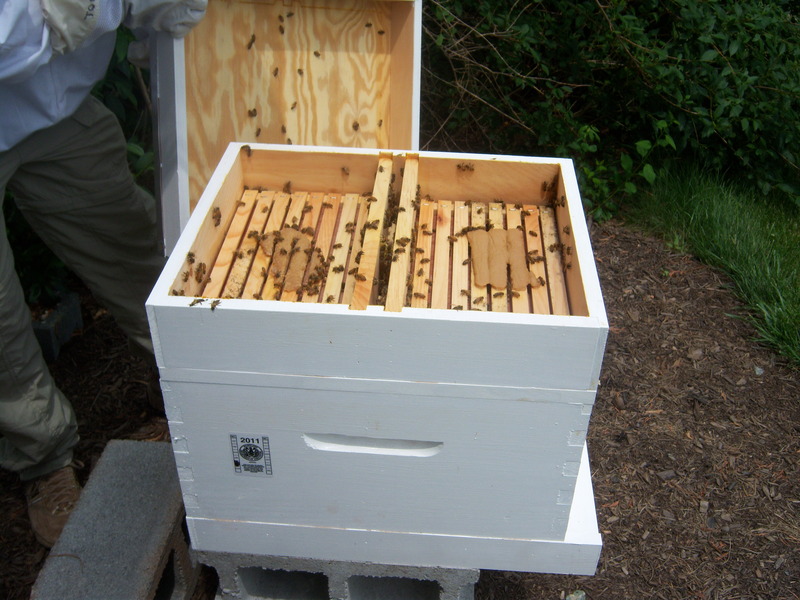 Last weekend when I looked into the hive for only the second time, I found that Boston had filled about one and a half sides of a new frame, but there was very little development anywhere else. Anaheim has only a little comb starting on one new frame. 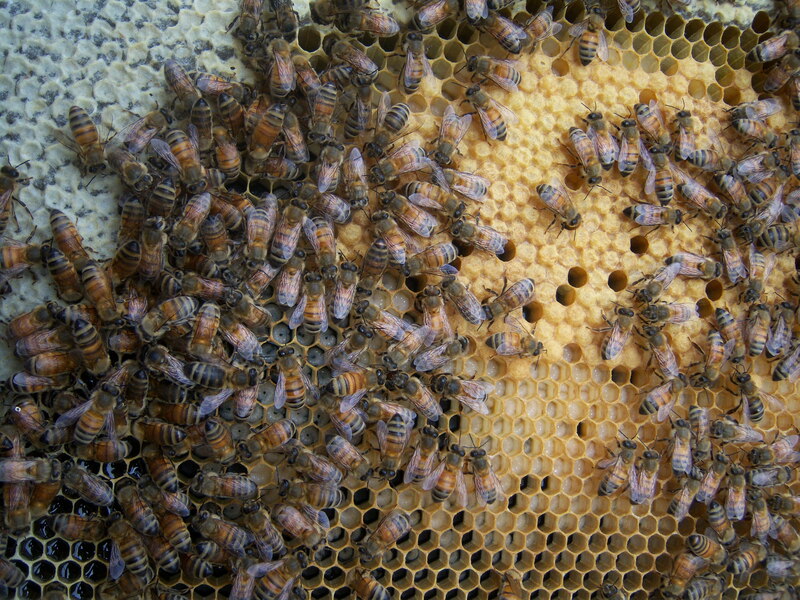 My nucs came as five frames: one full frame of honey, two frames of mostly empty comb and two frames of brood and bees. I don’t know how many bees I got, but my guess is about a pound or even less which might be about 3,000 bees. 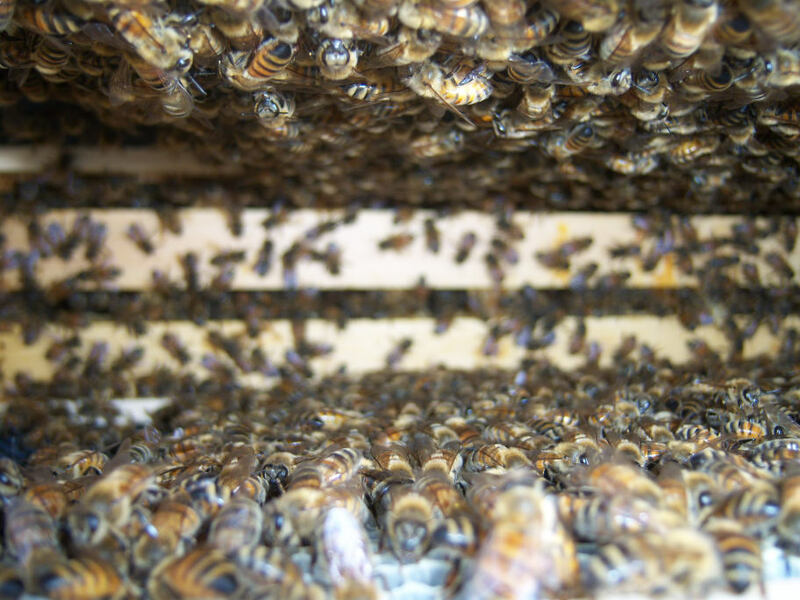 Of course, there is also brood in many stages which means that new bees are in the pipeline. 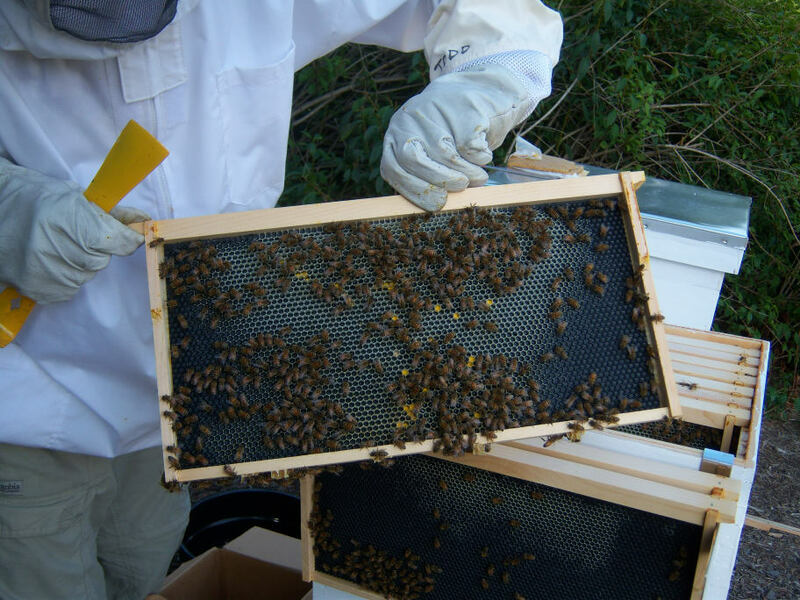 The other main option for starting a hive is to get a package of adult bees usually either three or four pounds which means in the 10,000 to 15,000 bee range. But these installations have no brood and the queen has to acclimate herself to her new home and start laying eggs which take around three weeks to hatch. 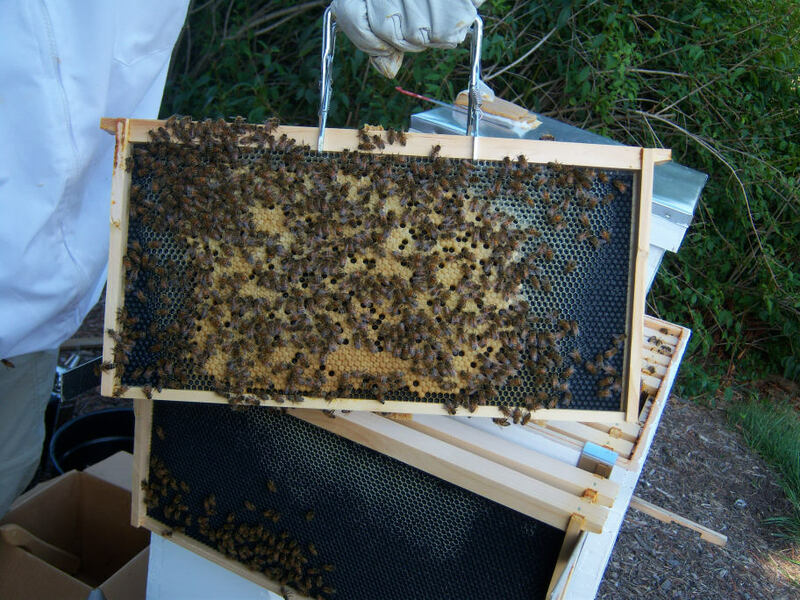 I assumed that my small village of two or three thousand bees would soon be 10,000 and the queen would quickly fill up the drawn comb with more brood and start drawing comb on my five brand new frames that fill out the 10-frame hive box. I’m sure I was being a bit impatient, but now after a month, I feel like I might have doubled the population in each hive, but still not made much progress toward filling up the hive boxes. I hadn’t thought too much about the timing, but apparently the biggest growth spurt of the year comes in the early spring, perhaps mid March through mid May here in Maryland. That is when there is lots of flowering going on and most of the bee populations grow to swarming proportions. I got my bees right after that population explosion (which makes sense if you are selling nucs) and now hive development is much slower. There is still lots of stuff I still don’t understand. 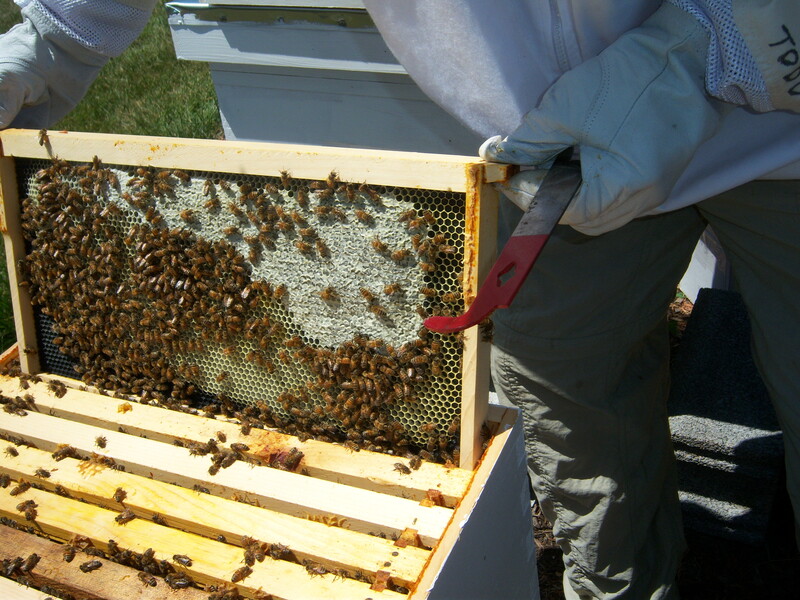 Like if the nectar flow has slowed way down in June and July, why is it that the honey harvest is in July or August? I won’t get any honey this year. I knew that from the outset, but I am already worried that my hives won’t have enough bees or honey to make it through the winter. Patience. The bees are smarter than I am at this and they probably have it all under control. I continue to feed them. They have never stopped taking my sugar water, so I will continue to make it for them. I am currently using a concentration of about 1 cup of sugar to 1.5 cups of water. Hopefully there is a little burst of nectar and pollen in late August and September and this may be when they are starting to store up honey for the winter. The Honeybees had a pretty ideal first week. The weather was pretty warm and we had lots of sun. This is when the bees are the busiest and happiest. One thing I learned in my classes was not to bother the bees and a cold or rainy day. The bees are bored and they are just look for trouble. One hive, right from the first day, has been more active than the other. I can typically count 10 bees coming and going for every one at the other hive. This can’t be good. I could see bees landing at the entrance of hive 2 loaded with pollen (stuck all over their back legs), some bright yellow, some darker orange. The new bee larvae needs to be fed pollen or stuff made with pollen, so seeing all this pollen moving into the hive is a good thing. The nucleus colony I started with has frames of brood (developing babies), honey, some pollen, and some uncommitted comb that can be used for brood, pollen or honey. I can only hope that hive 1 has enough pollen and the bees are busier on the inside of the hive attending to the ‘nursery’. Maybe hive 1 has more young bees that work inside the hive and hive 2 has more foragers who go out to collect food. The bees will work it out. 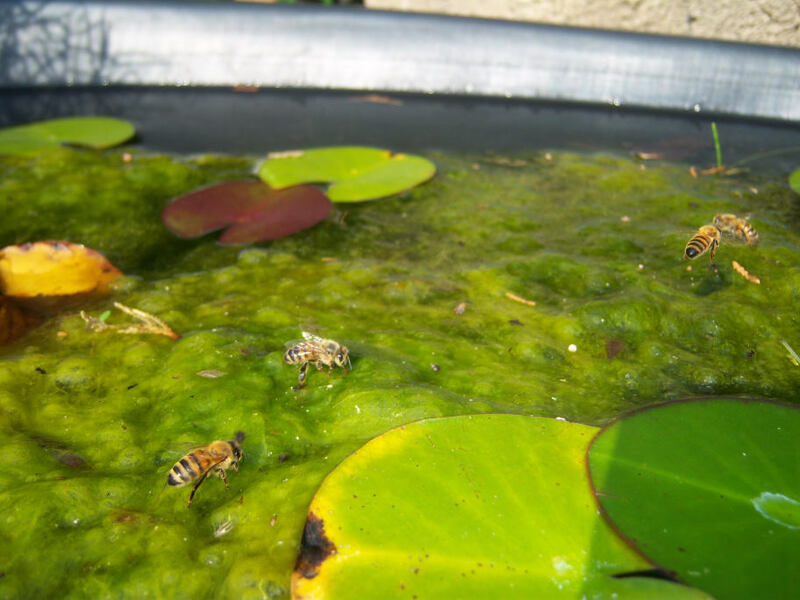 As long as the weather is hot and sunny, there should be food available and every three weeks or so, a whole new generation of bees is born and begin their life cycles. I don’t expect to harvest any honey this year. I just want to make sure there is enough honey to get the bees through the winter. Occassionally it is necessary to combine two weak hives into one hive to survive the winter. 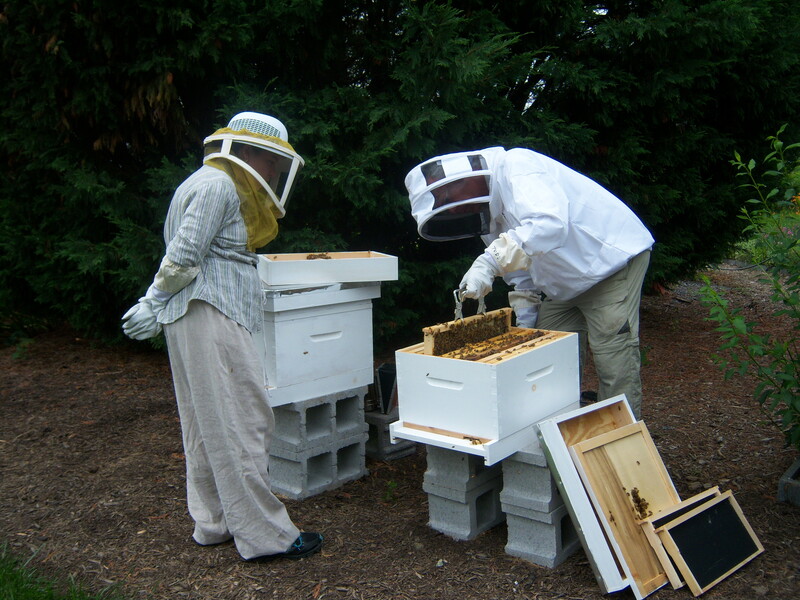 It is better to start spring with one healthy hive than two dead ones. But combining means that I will need to get another queen and do a ‘split’ in the mid spring to get back to two hives.